Prefabricated homes – or prefabs – are more likely to conjure up images of rundown mobile homes rather than residential palaces. 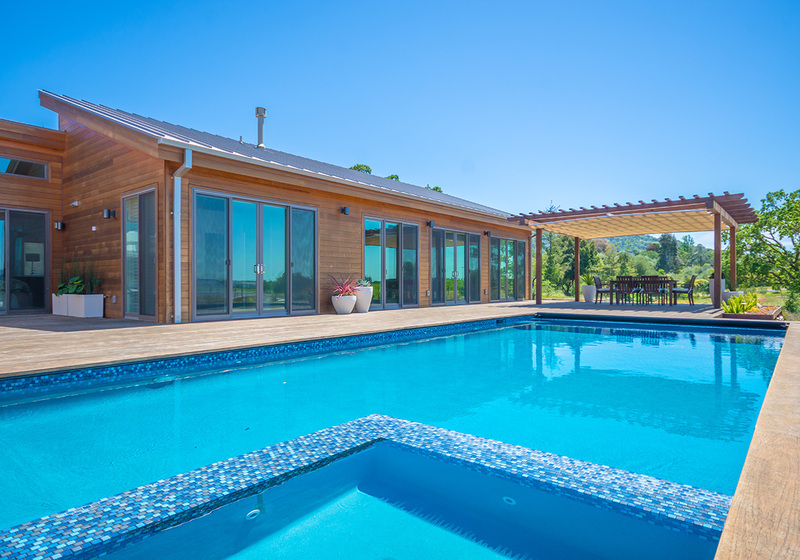 With an eye towards customization, as well as affordability, California prefab manufacturer Blu Homes is changing that perception. Founded in 2008, the company set out to radically revamp how luxury homes are built. The answer? Prefabs. Traditionally these modular homes were fairly basic and boxy-looking. Over the past few decades, innovations have allowed manufactured homes to cater to a more upscale market and to homeowners looking to go green. When it comes to modernizing prefab homes, few can compare to Blu Homes. Modular homes are built faster because they arrive at the site partially constructed. This is one of the big advantages of prefab homes. Mainly because the parts of a prefab home come pre-made. All a buyer would have to do is assemble and connect the house to the necessary utilities. Hence the name “modular.” The prefab house goes up much faster because it arrives partially constructed. All Blu Homes’ projects are built in the company’s state-of-the-art 250,000 sq. ft. factory in Vallejo, California. Because of this, the company can simultaneously work on laying the foundation at the build site. 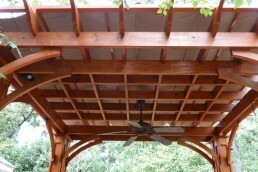 This dramatically expedites the building process and avoids complications that often delay construction. Once the house is ready, it’s shipped by truck to the site, where cranes then fit the pieces together in a single day. As a result, a Blu Home can be ready to move into in 3 months or less, compared to an average construction time of one to two years for traditional homes. Fewer laborers equal more savings with prefab houses. Building a prefab home is generally less expensive than building a comparable custom home. Part of the savings has to do with labor. It takes fewer laborers working over the course of fewer days to make a prefab move-in ready. That saves you money. The other part has to do with the building materials. Blu Homes uses its innovative design and precision factory technology to achieve this lower cost without losing any of the quality and finishes of a premium home. No matter what model, layout or finishes, Blu Homes’ products are sold at a predictable price before building starts. Natural light and clean air flow help to promote a healthier lifestyle. Blu Homes is committed to green. Cutting-edge features of their homes include advanced thermal insulation that keeps houses cozy even during the chilliest winters; energy-efficient electronics, such as LED light bulbs and zoned heating and cooling; and eco-friendly water fixtures like low-flow faucets that can save up to 50,000 gallons each year. Their homes’ soaring ceilings make them feel more spacious and the open frame design of these steel homes also allows for an open floor plan. The natural light and clean air flow help to promote a healthier lifestyle. 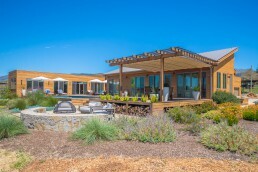 As a bonus, modular homes’ tight construction has earned them a reputation for being able to withstand natural disasters. Many Blu Homes feature folding glass doors that open to the outdoors, connecting the interior space to nature. 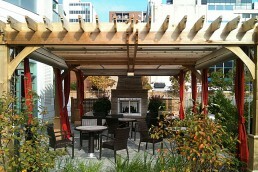 Blu Homes’ architectural design encourages indoor-outdoor living. 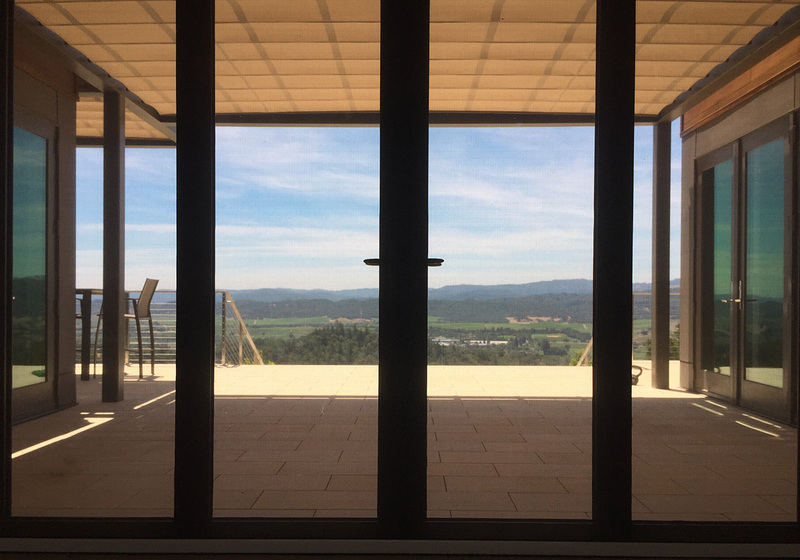 Many feature folding glass doors that open to the outdoors, connecting the interior space to nature. 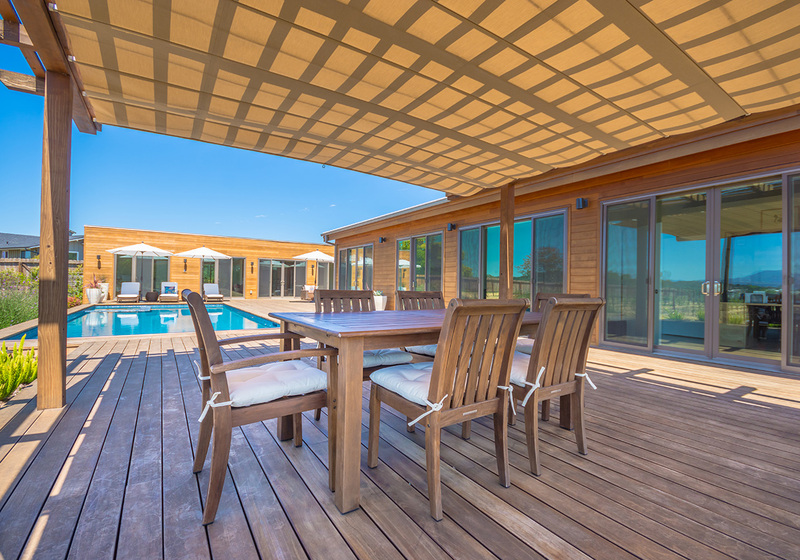 Beyond the glass doors often opens to an expansive deck with the option of retractable shade. 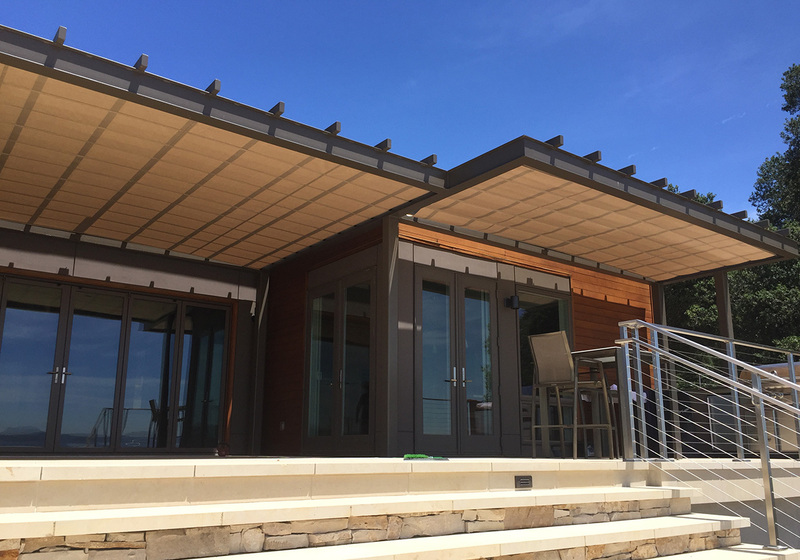 For this home in Napa Valley, California, having this versatile shade solution was a must-have. Blu Homes are the architectural embodiment of premium prefab living. Built in half the time and price of conventional custom homes, Blu Homes’ high ceilings, walls of glass, luxury quality finishes, and integrated high-performance technologies provide convenient and comfortable living, inside and out. ShadeFX has been fortunate to work on a couple Blu Homes projects over the years, with great success and even greater customer satisfaction. What do Blu Homes and ShadeFX have in common? Customization. Learn more here.